Add some bloom to your showroom! ⁣Our color charts get a serious update in 2019. We now introduce 20 new Color Gel colors and 20 new Glamazone gel polish colors. Great colors, easy to use, without spilling and does not break. Beautiful colors for a striking result! 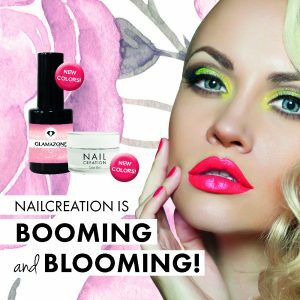 Glamazone, the new gel polish that you apply super easy and removes quickly. Perfect nails, day by day. Beautiful colors, a unique high gloss, no slab and scratch-proof: Glamazone has it all! Absolutely beautiful: you simply remove Glamazone within ten minutes. Request the Matt That! productsheet today! Leave your name and email address and receive the Nail Creation catalog in your inbox. Join our mailing list to receive the latest news and updates of Nail Creation every month.